ST. GEORGE — Lightning played havoc with the soccer matches in the area, suspending one and delaying others. Meanwhile, four Region 9 volleyball teams were in action Tuesday night, with all four on the road. And in tennis, played mostly in the afternoon before the lightning and rain kicked in, three Region 9 matches were completed. Pine View’s home match against Waterford, scheduled for 7:30 p.m., never did get any meaningful action in and was called after several delays. 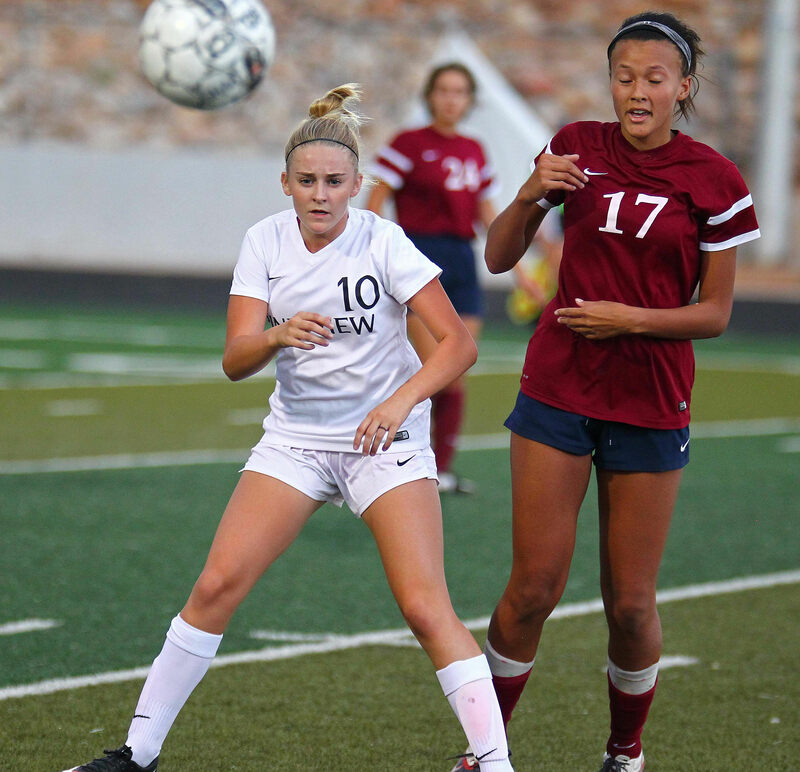 Snow Canyon, facing Ridgeline (from Cache Valley), started its match earlier in the evening and the Lady Warriors were able to squeeze in a 0-0 draw against the first-year Riverhawks. Cedar, meanwhile, faced fellow Iron County mate Canyon View and walked away with a convincing 4-0 victory in the afternoon game. In the Snow Canyon match, the Lady Warriors had triple the shots on goal as Ridgeline, but couldn’t slip one past RHS keeper Abbi Kotter. Megan Rogers and Preslee Gates combined for the clean sheet for Snow Canyon, which went to 2-2-1 on the preseason. The Warriors are home against Arbor View, Nev., Friday night at 7:30 p.m.
Cedar’s record improved to 1-2-0 with the whitewash Tuesday night over the Falcons. Goalkeeper Emily Pearson recorded the shutout for the Lady Reds. Cedar got a pair of goals from Lindsey Robinson and one each from Ashley Jenkins and Rachel Hunt. Cedar plays next on Sept. 1 with a home match against Parowan. Canyon View will host Pine View on Thursday night, with Hurricane at Spanish Fork Friday and Saturday matches featuring Arbor View at Desert Hills, CV at Dixie and Hurricane at Stansbury. Dixie pulled out a victory over North Sanpete but the other three region 9 road teams fell in straight sets Tuesday night. The Lady Reds were swept by Millard Tuesday night 25-8, 25-14, 25-20 in their season opener. Dream Weaver led the team with four service aces and 10 digs. Kylee Field and Shaun Bauman had seven and six digs respectively. Millard moves to 2-0. Cedar is 0-1 and will travel across town to take on Canyon View on Aug. 30, before hosting Juab in the home opener on Sept. 1. After dropping the first set, Dixie came back to take the next three and leave with the win 14-25, 25-23, 25-23, 25-17 win. Ella Burrows led the Lady Flyers with seven kills and six blocks. Grace Brown had 14 digs defensively. Dixie improves to 2-0. The Flyers will host Spanish Fork on Thursday night. North Sanpete falls to 1-1 and will host Manti next. The Lady Tigers were swept by Kanab 25-13, 25-16, 25-19. Jaeden Smith led Hurricane with three kills. Holly Isom led the team with 10 digs. Hailey Homer led the team with 12 assists. Team captain Sierra Davis missed the match due to illness. With the victory, Kanab improved to 1-1. The Cowgirls will play at Panguitch on Aug. 30. Hurricane falls to 0-3. The Lady Tigers travel to Richfield on Thursday. Game time is set for 7 p.m.
Enterprise went 2-0 on the early season with a sweep of the Lady Panthers, 25-22, 25-22, 25-23. Jaslyn Gardner and Ronnie Robinson recorded nine and six kills, respectively, for the Lady Wolves. Lacy Drake and Tori Phelps led Enterprise with 20 and 13 digs, respectively. Phelps also led the team with 22 assists. With the loss, Pine View falls to 0-1. The Lady Panthers will next host Kanab on Sept. 1. Enterprise improves to 7-3. The Lady Wolves travel to Desert Hills this Thursday. Pine View swept past Dixie 5-0, with Hattie Erekson recording a 6-1, 6-0 sweep at first singles. Erekson, who made it all the way to the state semifinals last season as a junior, is widely considered the top girls tennis player in southern Utah. Brielle Callahan won at second singles and Julia Meyer won big at third singles. The teams of Charisse Snow-Hannah Obray and Ryann Blaser-Kiralyn Malloy also won in the double matches. Desert Hills edged Cedar 3-2 with first singles player Abby Houston leading the way. Snow Canyon also got a 3-2 win, over Hurricane, with first singles player Brielle Nielsen leading the way with a win.